Welcome to The Durbervilles website. Welcome to The Durbervilles little home on the web! Direct from the Batley delta of West Yorkshire, we bring a meld of originally penned tunes which blend folk, roots and alt country music. We feature four part harmonies, thoughtful (sometimes fun) lyrics and tasteful measures of music-like twiddling. 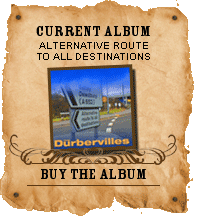 The Durbervilles have existed for around a decade with a fist full of critically acclaimed albums to our name. When we formed we found ourselves being categorized as a part of the burgeoning UK “Alt Country” scene (and were probably the first band of that kind to emerge in Yorkshire). As our style developed we have since been embraced by the Folk & Roots community and can boast a long list of folk club and festival successes. Our sound has been described by R2 magazine as like the “rootsy edge of Steve Earle & Lindisfarne and with a folkie's grasp of the instrumentals.” while Maverick magazine says “the Durbervilles do not stick to the English Folk route but throw country and Cajun into the mix to make a glorious sound”. 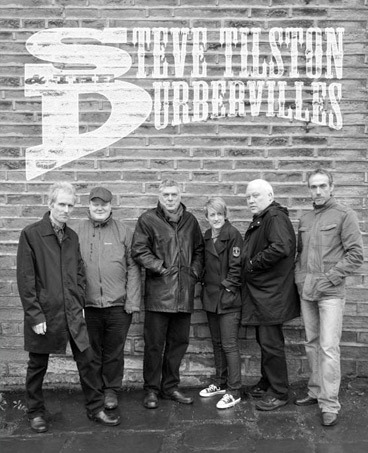 The Durbervilles line up is Lee Walsh – vocals, 12 string guitar, mandolin, bouzouki, mouth organ; Mark Boyce – drums, vocals; David P Crickmore – lead guitar, mandola, banjo, slide guitars, backing vocals; Gus Taylor – accordion, vocals; Ruth Wilde – double bass. 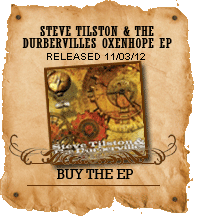 In recent years The Durbervilles have teamed up with 2012 BBC Folk Award winner Steve Tilston working in the studio and live to provide a big band sound that highlights both acts. The Durbervilles have also enjoyed other musical collaborations with Jude Abbott and Neil Fergusson from Chumbawamba and Ric Sanders from Fairport Convention. Guitarist David Crickmore from the band has in turn contributed to Chumbawamba’s The Boy Bands Have Won album, and played on the theme to Billy Connolly’s career retrospective TV special. Mark Boyce has become session drummer of choice for Clive Gregson and has recently worked alongside him on a project involving double bassist Andy Seward and legendary record producer John Wood. Ruth Wilde has toured as the double bass player for Kit Holmes. Mark, Lee and David are also presenters on their weekly BBC radio programme The Durbervilles Folk & Roots Show. ...their particular take on roots music from Cajun to country rock (is) informed by genuine folk sensibility and reinforced by considerable instrumental skill….don’t miss them.”LIVING TRADITION. 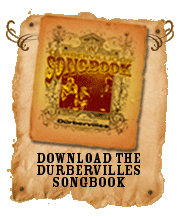 The Durbervilles record for Splid Records distributed by Proper.